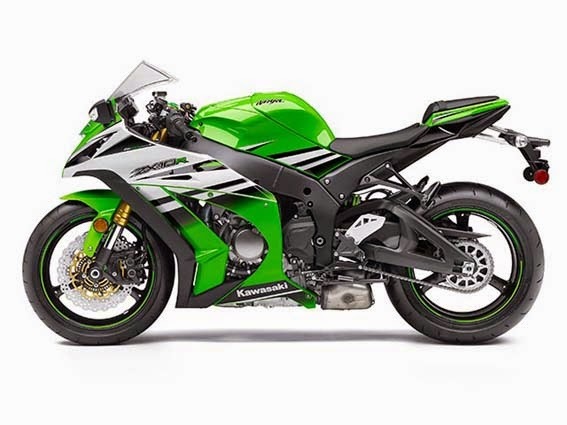 2015 Kawasaki Ninja ZX-10R 30th Anniversary Features, Specs and Price - To celebrate the 30 years of Kawasaki Ninja, Kawasaki motorcycle manufacturers releasing super bike special edition namely Kawasaki Ninja ZX-10R ABS 30th Anniversary and the Kawasaki Ninja ZX-10R 30th Anniversary. 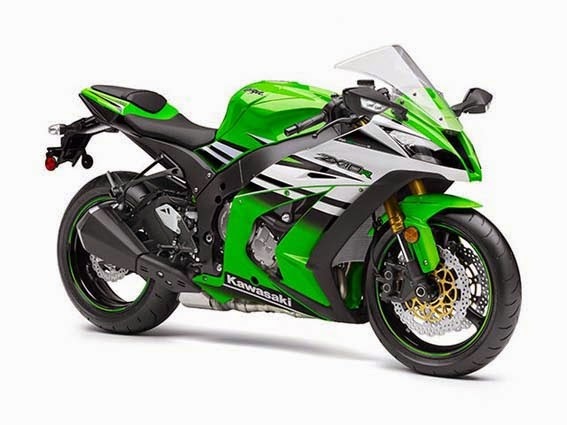 For engine sector, the Kawasaki Ninja ZX-10R 30th Anniversary still carrying the engine capacity of 998cc, 4 stroke, inline four, liquid-cooled, DOHC, 16 valves are mated with a 6 speed transmission. In the United States, the price of Kawasaki Ninja ZX-10R 30th Anniversary ABS priced at $ 15,599. LED taillight : Compact tail cowl culminates with an elegant LED (9-bulb) taillight. Headlamps: Line-beam headlamps enable front cowl to be made shorter, contributing to the sharp, aggressive design. Fuel tank: Design of the sculpted fuel tank follows the same theme of “curves.” Fuel tank capacity is 17 litres. Brakes: Radial-pump front brake master cylinder operates Tokico radial-mount brake calipers with dual pads for formidable stopping performance, superb initial bite characteristics and a high level of control care of progressive feel after the initial bite. Aluminium swingarm : Like the frame, the swingarm is an all-cast (3-piece) construction. The swingarm’s rigidity balance was designed to complement the frame. Complex design contributes to appearance and a high-quality image. Mirrors with integrated LED signals: Cowl-mounted mirrors features integrated LED-type (2-bulb) turn signals (a first on a Japanese mass-production model). The turn signals are connected via couplers, facilitating mirror removal for trackday use. Exhaust system: Exhaust header pipes, formed from heat-resistant titanium alloy, have almost the same length and diameter as their race-use counterparts. (This feature makes it easier for riders to increase exhaust performance (for track applications) without having to replace the entire exhaust system. Instrumentation : The centrepiece of the instrument panel is the highly visibly LED-backlit bar-graph tachometer. The multi-function LCD features two display modes: Standard and Race. Switching to Race Mode alters the display as follows: Main LCD: Speed => Gear position Right side: Clock => Speed To switch to Race Mode, toggle the multi-mode display on the left side to Lap Timer. 998 cm³ Liquid-Cooled Engine : The engine offers linear power delivery right to its heady peak power. To ensure ideal engine manageability during all parts of the corner. Peak torque was moved to the higher rpm range, eliminating the torque peaks and valleys that made it difficult for racers to open the throttle with confidence. BPF (Big Piston Front fork) : The BPF is one of the great contributing factors to the enhanced composure under braking. Reducing the damping pressure allows the slide pipe to move more smoothly. The result is greater control as the fork begins to compress and very calm attitude change as vehicle weight shifts forward when reducing speed, and thus greater chassis stability on corner entry. Aluminium Twin-spar frame : The twin-spar frame traces a more direct line from the head pipe to the swingarm pivot. This delivers more linear behaviour, translating to greater control. Frame twist was designed to be as close to the main pipes as possible, which further facilitates rider control. Frame also offers increases cornering stability and a high level of feedback. 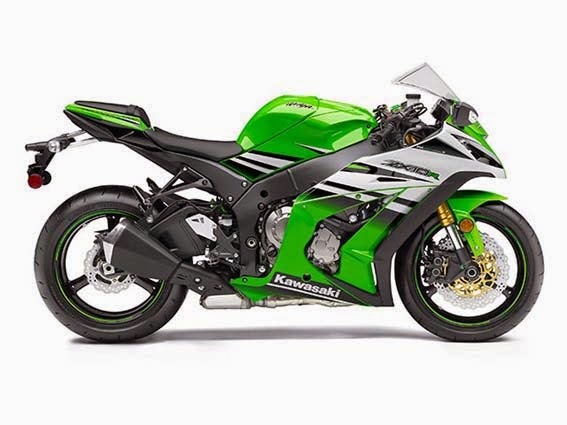 KIBS : Kawasaki developed KIBS to take into account the particular handling characteristics of supersport motorcycles, ensuring highly efficient braking with minimal intrusion during hard sport riding. It is the first mass-production brake system to link the ABS ECU (Electronic Control Unit) and engine ECU. In addition front and rear wheel speed, KIBS monitors front brake caliper hydraulic pressure, throttle position, engine speed, clutch actuation and gear position. This diverse information is analysed to determine the ideal front brake hydraulic pressure. Through precise control, the large drops in hydraulic pressure seen on standard ABS systems can be avoided. Additionally, the tendency on supersport models for the rear wheel to lift under heavy braking can be suppressed and rear brake controllability can be maintained when downshifting. Horizontal Back-link Rear Suspension : Compared to Kawasaki's traditional Uni-Trak rear suspension, which mounts the shock unit vertically, with Horizontal Back-link rear suspension, the shock unit is almost horizontal. Kawasaki's original suspension arrangement locates the shock unit very close to the bike's centre of gravity, greatly contributing to mass centralisation. And because there is no linkage or shock unit protruding beneath the swingarm, this frees up space for a larger exhaust pre-chamber (an exhaust expansion chamber situated just upstream of the silencer). With a larger pre-chamber, silencer volume can be reduced, and heavy exhaust components can be concentrated closer to the centre of the bike, further contributing to mass centralisation. The result is greatly improved handling. Another benefit is that the shock unit is placed far away from exhaust heat. Because it is more difficult for heat from the exhaust system to adversely affect suspension oil and gas pressure, suspension performance is more stable. Horizontal Back-link rear suspension offers numerous secondary benefits like this. S-KTRC : S-KTRC, Kawasaki's original predictive traction control, uses the same base technology as the Kawasaki works machines that competed in MotoGP, the pinnacle of motorcycle racing. This technology continually controls the rear wheel slip that occurs when power is applied, ensuring optimal acceleration. In general, maximum forward drive requires a certain amount of slip (usually between 20-30% slip ratio, i.e. the rear wheel is turning 20-30% faster than the front). To ensure the most effective transfer of power to the tarmac, S-KTRC monitors the slip ratio in real time, and governs engine power delivery to optimise rear wheel traction. S-KTRC monitors a number of parameters, including front and rear wheel speed, engine rpm and throttle position. Conditions are confirmed every 5 milliseconds, at which time the system looks at each of the parameters as well has how much they are changing (i.e. their rate of change). This unique Kawasaki method makes it possible to interpolate and predict how the bike will behave in the next instant. Unlike 1-mode KTRC, which cuts power as soon as rear slip is detected to allow rear traction to be regained, S-KTRC uses minimal power drops to ensure the slip ratio for optimal traction is maintained. Because its goal is to maximise acceleration, as long as sufficient forward motion is observed, this sport riding system will allow power wheelies as the bike comes out of corners. Power Modes: Power Modes allow available power and throttle response to be selected to suit conditions. On the supersport Ninja ZX-10R, three modes are available: Full, Low (which limits power to about 60% of Full) and Middle mode, which falls between the two. More than a simply bisecting the Full and Low mode power curves, in Middle mode performance characteristics vary depending on engine speed and throttle position. At less than 50% throttle application, engine performance is essentially the same as in Low mode. However, opening the throttle past 50% allows performance up to that of Full power to be accessed. This advanced engine management system allows mild engine character for normal riding situations, with the option to tap into greater power for a quick burst of acceleration. Variable Middle Mode offers riders the ability to alter engine performance and delivery by conscious use of throttle control (either for ease of control when riding in the city, or for greater response when the rider calls for quick acceleration). This kind of technology allows supersport machines to be enjoyed in a broader range of situations. Dual Throttle Valves: Late-model sport bikes often use large-bore throttle bodies to generate high levels of power. However, with large diameter throttles, when a rider suddenly opens the throttle, the unrestricted torque response is anything but gentle and often more than the rider can handle. Dual throttle valve technology was designed to tame engine response while contributing to performance. On fuel-injected models, throttle bodies generally have only one throttle valve per cylinder. On models with dual throttle valves, there are two throttle valves per cylinder: in addition to the main valves, which are physically linked to the throttle grip and controlled by the rider, a second set of valves, opened and closed by the ECU, precisely regulates intake airflow to ensure a natural, linear response. With the air passing through the throttle bodies becoming smoother, combustion efficiency in improved and power is increased. Like other Kawasaki engine management technology, Dual Throttle Valves were designed with the philosophy of "following the rider's intention, while providing natural-feeling support." They are featured on many Kawasaki models. Economical Riding Indicator: Using high-precision electronic control for engine management, Kawasaki models can achieve a high level of fuel efficiency. However, fuel consumption is greatly affected by throttle use, gear selection, and other elements under the rider's control. The Economical Riding Indicator is a function that indicates when current riding conditions are consuming a low amount of fuel. The system continuously monitors fuel consumption, regardless of vehicle speed, engine speed, throttle position and other riding conditions. When fuel consumption is low for a given speed (i.e. fuel efficiency is high), an "ECO" mark appears on the instrument panel's LCD screen. By riding so that the "ECO" mark remains on, fuel consumption can be reduced. While effective vehicle speed and engine speed may vary by model, paying attention to conditions that cause the "ECO" mark to appear can help riders improve their fuel efficiency – a handy way to increase cruising range. Further, keeping fuel consumption low also helps minimise negative impact on the environment.